The 14th of 21 street lamps to be installed as part of Mischa Kuball’s Solidarity Grid. 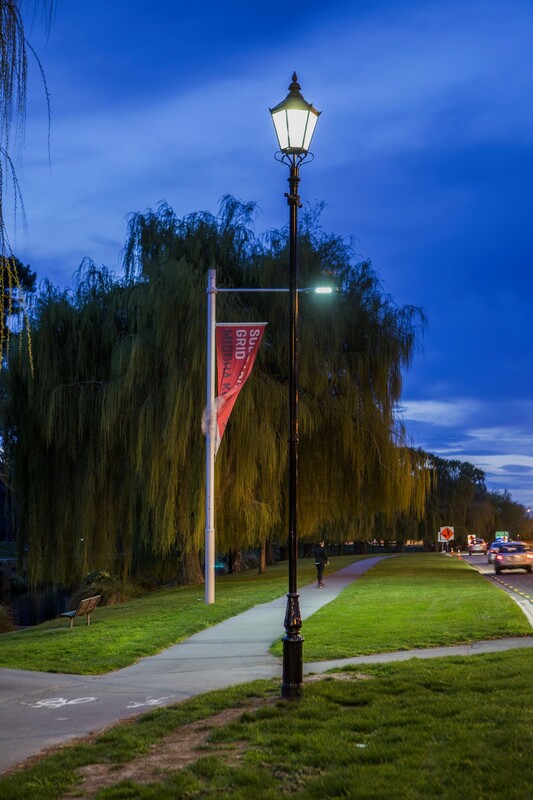 Our namesake city, Christchurch, Dorset, United Kingdom (although the cities shared name is purely coincidental - Christchurch, New Zealand is named after Oxford University's Christ Church College) has donated a tall, slender street lamp of traditional British style with cross bar feature, decorative steel ribbons and a glowing, peaked lantern box. Christchurch, New Zealand and Christchurch, Dorset, United Kingdom became Sister Cities in 1972. The lamp was contributed to mark the centenary of the First World War which bound our two cities together as the Canterbury Regiment from Chrischurch, New Zealand was based near Christchurch, Dorset, United Kingdom. It also recognises 40 years of our Sister City relationship - a milestone celebrated in 2012. On the south coast of England, Christchurch, Dorset is a town similar in population to New Plymouth in New Zealand. It attracts over 1.5 million tourists annually to visit its historically significant buildings, traditional pubs, dramatic coastline and peaceful nature reserves.